We’re off to a wedding, a birthday party, my in-laws, and then to visit my grammy (Adriana gets to meet her Great-Grammy!) over the long weekend. This means we’re going to clock a ton of hours on the road, so I am coming prepared! 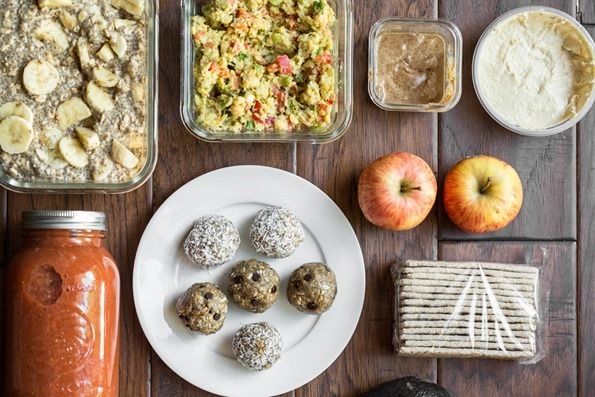 Even though a lot of our meals will be made for us (such as dinner Saturday and Sunday night), I like to fill in the blanks by packing some light meals and healthy snack options to have on hand. 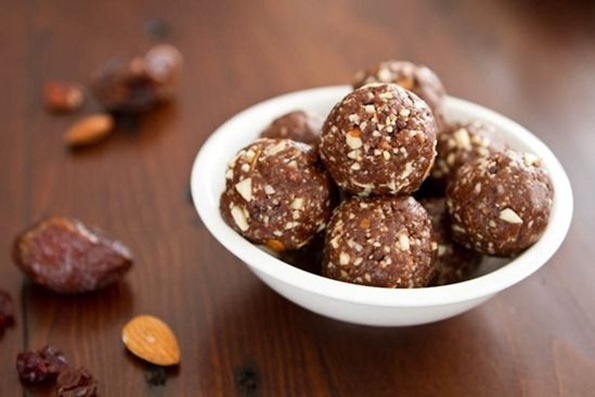 Energy bites – I’m still perfecting the recipe in the photo above so rather than sharing it before it’s ready, I recommend you try these amazing Dark Chocolate Cherry Energy Bites! <—a fav! Not shown: I’m also packing a few of my Coconut-Cardamom Overnight Oat Parfaits for the car! If I had more time I would’ve also made a batch of my Lightened Up Summer Granola. – These are my go-to glass storage containers. Mason jars also work lovely! – Pack several ice packs to ensure the food stays cool and fresh. You don’t want to arrive at your destination with room temperature food. – Pack the energy bites on top so they don’t get squished. – You can improvise with these recipes a lot. 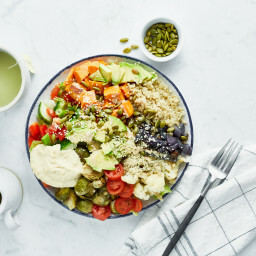 I make all kinds of versions of Gazpacho, the energy bites, and the chickpea salad. For this chickpea salad I didn’t have any celery so I just used a whole red bell pepper (diced) instead. It’s pretty forgiving so don’t worry! – Pack the gazpacho in a thermos if you want to save room in the cooler. Otherwise a large 2-quart mason jar will hold the batch. Ok, now I’m turning it over to you. Which foods do you like to pack for trips? Share your favs below! Well guys…I seriously cannot believe it’s August 1st. *still in a 2015 time warp* I hope you are enjoying the dog days of summer. Soak it up and have a fun + safe weekend!! Overnight oats, homemade bars and in-bulk family recipes are great ideas! I would pack a giant tofu scramble, portable fruits, baked sweet potatoes, rye crackers and hummus and guacamole too! :D yummy! Gosh, thanks for posting these. That’s the only time I really have problems… when travelling. These will be great. Can’t wait to try them. Baked sweet potatoes are one of my favorites too just because the kids think sweet potatoes are like candy. I love this post! We love going away for the weekends to our parents’ cottage on Lake Ontario. We love it there, it’s so peaceful. But food is always an issue. There is no place within an hour to buy food, except local roadside stands for things like zucchini and peaches. You are in BIG trouble if you don’t bring food. I find this post very helpful, it’s always tough to keep the cold food cold, especially since the AC broke in our van and is to $$ to fix. hehe. I am a huge fan of your blog and cookbook so imagine my surprise when i saw you were the cover article on a magazine from my local health food shop! http://www.yourhealthyliving.co.uk/magazinecurrent This may not seem like a big deal but i live in rural Wales!! Great to see you are making an impact on this side of the pond! Enjoy your weekend away! Love it! I make the chickpea salad a lot and whenever I don’t have celery, I use cucumber. It’s the perfect summertime lunch. Have a great weekend! Great ideas! What are your favourite crackers? sliced carrots with a dip are great as well. Great tips! Everything looks really delicious. This is great, everything looks super yummy! Your chickpea salad is so appealing…I am sure I am going to try and make it very soon. Thank you for the recipe! I’m always curious about what others take when they’ll be on the road for a while. Great ideas! I second bringing baked sweet potatoes. They’re mess-free and completely filling! Though something runny, sloppy, and messy has never stopped me from eating in the car haha. You are seriously the best!!! Thank you for sharing this type of info with us! Homemade protein baked goods, bars (like larabars and thunderbird bars), raw nuts, dry roasted edamame, dehydrated fruits and veg, raw chocolate, nut butter, and roasted sweet potatoes are my go to travel snacks! Amazing post! Very helpful! Thank you! I love everything you put on your blog. It is so much fun to find exciting things to fix. These are great ideas! I like to make my oat/date/chocolate chip cookies. They are packed with healthy whole foods. No flour or sugar. And they are yummy. Perfect travel food because they don’t need refrigeration and they last for a long time. Often I just keep them in my bag when I know I have a long day outside in NYC. Thx for these awesome tips!! My go to trip food is sandwiches. A salted avacado, tomato, sprout and tofu sammy with a few drops of hot sauce always hits the spot. I also use up my veggies with a rice pulao or quinoa salad with edamame and cashews and some mustard and cumin seeds and tumeric as a base. I will be trying the overnight oats for my next trip! What an awesome idea Angela! The key to staying on track is DEFINITELY pre-planning. I run a plant-based diet reset group to help people eat clean, lose weight and get healthy, and this will be a wonderful resource for them!!! They always struggle with a few things 1) the prep work, 2) the perceived cost and 3) traveling and pre-planning. Thank you for this! xoxox! This is such a great idea, Angela! I usually bring energy bites, crackers, and fruit! But next time I’ll pack hummus and vegan overnight oats too! :) Enjoy your time with friends and family! humm, I usually just go for apples, nuts, dried tomatoes, soy-joghurt and stuff like that because i’m afraid of not being able to keep things cold enough, will have to try some of yours though! Angela I really love this post! I love the way you laid it out, super inspiring. We do the same thing when going on road trips and I totally know what you mean about turbo mode:) We usually bring green juice and smoothies and then trail mix, hummus and raw salad and usually a big salad! Hope you had fun! Sweetie! I’m so glad I found you! :) :) I just turned vegan and I needed some inspiration for road trip snacks. A bunch of bananas is not a bad idea, but putting my food in a container sounds even better!! Oh this all looks so yummy!! Any tips or suggestions for plane traveling foods? We will be traveling almost a day in and out of airports and I need some portable snack suggestions :) thanks! I’ve had good luck making wrap sandwiches – whole grain tortilla with greens, tomatoes, and seitan salad (veganaise, seitan, dill, red onion, whole grain mustard). They travel well and are easy to eat in the plane. I found a BPA free cling wrap that holds it all together nicely. I haven’t made it yet, but Angela’s chickpea salad sounds like another great filling option. Forgot to mention – fold them up like a burrito by folding in the sides before rolling. It keeps everything from falling out. This couldn’t have come at a more perfect time for me! I was looking for ideas of things to take for myself to a family reunion this weekend, while everyone else will be eating BBQ. Thank you!!! Angela, your recipes never disappoint! Thanks for including this! Your chickpea salad is one of my absolute favorite and thanks for sharing the lightened up granola. I mailed batches of your granola clusters for Christmas to family and friends and over and over they said, “Where is the recipe?? ?” I pointed them to your cookbook and bought a few extra copies for them. Your website and cookbook have really been a godsend to my family. All the best to you and yours. When I was growing up, a Pounder bag of M&Ms was considered requisite road trip food. Don’t tell my sensitive parents, but NOT a tradition I want to pass on to my daughters! Hi Angela, I’ve been thinking of you ever since you posted that you were getting unkind emails about letting your daughter chose what she eats (versus insisting on vegan.) Making our own choices is one of life’s greatest gifts! Without force your daughter will lovingly follow your example and learn to love healthy eating. Im sure of it! And the beauty of it is that she will be that much more committed because she was allowed to choose for herself. I want you to know you’ve made a positive difference in my life. I keep finding more and more recipes that work for me from your cookbook! You have made my life better and I’m grateful to you. One person can make an amazing difference! Awesome round up! It makes trips much more enjoyable knowing there will be no stress over finding suitable food options on the road. I laughed so hard at Eric packing the blender. We used to do the same thing! Now I make a few smoothies the day before we depart and freeze them in individual bottles/jars. Thaw it out in the fridge the night before and the taste stays the same. You can thaw on the counter top or in the car too; it’s still yummy but the kale taste comes through a bit more. Needless to say, I also love this. I would pack your endurance crackers instead of the energy balls. I’m a huge fan of those and have to be careful with fructose. I love the fact that you are using glass containers! It’s so funny, I am a Swiss living in austria, so far away, but I feel so close to you – my husbands name is Eric too, he is American, and many things (including green smoothies) are such parrallels to your husband! He loves your food, btw, which is big! I hope you vontinue this for a loooooong time. Thanks for everything, now I’ll be “quiet” again. This post (together with the post about 2-day plant-based meal plan) is the most helpful one. It woud be great if you could write more posts with complete menus (it’s easy to pick up one recipe but I find it quite difficult to make a meal plan for a whole day). I love the idea of a portable gazpacho! My idea of eating healthy on the go usually consists of a ton of apples and bananas, plus a huge green smoothie in a jar. But I love these options here! I haven’t been traveling a lot lately, but I’m excited to look through your suggestions for when it happens again! Thank you for sharing these great ideas!!! Would be awesome to know what kind of foods you have packed for Adriana :). We are gonna do our first overseas trip with our little guy when he is 1 years old in September, so I am trying to gather ideas on what to bring! Love these ideas! I do hummus (usually two variations), three bean salad, baked oatmeal (heavenly carrot cake is a fave), tabbouleh, fruit (usually apples, grapes and oranges because they last longer) and then crackers of a couple persuasions and pretzels. I’ve also been known to put carrot sticks and celery sticks in a jar on top of 3 or 4 TBs of nut butter for quick snacking on the go. I also use mason jars. Eco friendly, don’t smoosh, and washable. Why do I get excited with this snack pack, especially the energy bites. It would be amazing if its assorted and just be delighted of the flavor you picked. And oddly any food made for getaways has its magic, it will always taste good and better than eating the same things at home. Packing food for trips always seems to take forever…it was inspiring to see it can be done in less than one hour! Favorite foods to pack: popcorn (despite the messiness! ), carrots + hummus, my go to breakfast of buckwheat/millet + raisins/coconut/cinnamon, fruit. I usually just pack snacks like nuts, fruit, or granola bars or something; I never thought to actually make anything. I’m going to try that next time — starting with your energy bites and overnight oats! I have no problems with packing snacks, emergency oatmeal packets or anything to help get my husband and I through a trip. Problems arise, specifically when we stay with family or friends. What do you say to them when you show up with a cooler full of your own food? How do you answer questions of why you packed your own food? How do you ensure you don’t come across as some elitist who is too good for their food? These are all very scrumptious ideas for a weekend summer trip! Gazpacho is definitely one of my favs and so easy and refreshing! I’m excited to try vegan overnight oats! 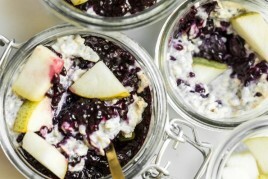 I always do overnight oats but never tried with chia seeds! Can’t wait to try tonight! This is SO helpful. It can be so difficult to maintain healthy eating habits when you’re out and about and traveling on the weekends. Thanks so much for sharing! These are such great ideas! I haven’t made gazpacho before and can’t wait to try this. 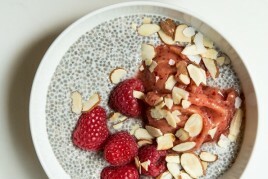 I DO make chia pudding pretty much every time I go anywhere and it travels so well! Great job on doing 4 recipes in under an hour. My hero! Going away for a 3 day bike trip to sunshine coast this weekend. Was thinking of easy to pack food and your post couldn’t be more perfect! Yummy! Thank you for sharing your travel food. We just went on a road trip and we are bug fans of fresh fruit, vege sticks (carrot, cucumber and capcicum) and home made seed cookies! Mmmmmmm everything looks so incredible! I’ve been traveling basically every week this summer, and it definitely threw off my eating! I love that it’s all quick and easy to make, too! 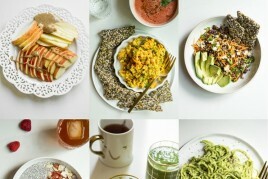 Angela, I’ve been reading your blog for a couple years for healthy food inspiration, for which it is a treasure trove. I want to extend thanks more than ever now, though, as I’ve come to see how helpful it’s becoming as I try to eliminate plastic from my lifestyle. This post sent me to endurance crackers, and I can’t wait to try those, as well as your spelt flatbread. And it’s encouraging to see you traveling with these more sustainable options instead of getting take-out on the road. Thank you! I’m usually traveling by plane so the liquids and pudding/hummus are out but i’ve been fine with a nut butter cracker “sandwich”. I have a little one as well and this is a great reference for packing food for a trip, thank you! I love this post, it’s just what I needed, a look into how other people cope with going on trips and what to do about food, it’s really inspired me to be more adventurous and not just rely on fruit and nuts! Thank you! I make energy balls too! They were inspired by the ones my mom used to make 35 years ago. Blend everything except honey and crushed cereal in a medium bowl. Pour in honey and stir. Add crushed cereal and stir until thoroughly combined. Refrigerate (this helps them become less sticky). Roll into Tablespoonful-sized balls, place in a covered container, and refrigerate until eaten. They keep quite awhile. I just made the gazpacho. It made it an hour chilling. This is truly my favorite recipe ever, and I swirled homemade pesto throughout. Yummy! This was perfect today after a hot Georgia day. For the last year, I ALWAYS bring a batch of thumbprint breakfast cookies and a container of almond butter. The cookies can be breakfast, snack, or dessert. As a vegetarian who doesn’t eat soy or sugar, I hate to put out the nice folks I’m staying with with my dietary restrictions. The cookies are also fun to share – everyone I’ve shared them with asks for the recipe. Other go to foods for the road are hummus and Beanitos chips. Great idea for packing food. I could really use what I learned from these tips whenever we go to parks or on the beach. It can save me money and my family can eat healthier food. What a great idea! I’m a vegan travel blogger so I often have to do a lot of day trips with heaps of picnics, I’ll be sure to come back to this post in the future for inspiration and ideas! That’s the link to my vegan travel blog, which is the first of its kind! I’d really appreciate it if you’d check it out and let me know your thoughts? :) Best! Thanks so much for this post! It came at such a great time for me as I was wondering what to bring on my weekend away. I made overnight oats, peanut butter chocolate chip cookie bites (from your cookbook), humus and gazpacho. The gazpacho was amazingly refreshing and delicious! This is going to sound a bit weird, but I woke up this morning needing a little pick me up and the gazpacho hit the spot! I loved having all those veggies first thing in the morning! My husband and I have been traveling for the past 13 months so travel food is always on my mind. Keeping food cool is a constant challenge so I usually opt for non refrigerated items. I also don’t usually have a lot of ability for advanced preparation. 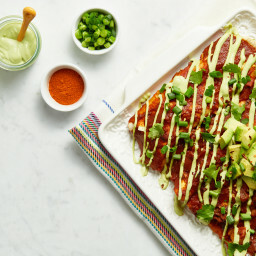 Besides the obvious bananas, apples, and nut butter, one of my favorite meals is tortillas with a can of refried beans, tomato, Tabasco, avocado, and bell pepper in a tortilla. (Tortillas are easier for travel because they don’t get smushed as easily as bread. ) I also recently discovered Mama Gone crackers. Love! I make overnight oats with water so it doesn’t need refrigeration and it works great. I love bringing a big frozen lasagna with me. They stay rock solid being transported in a cooler, and then are closer to thawed out by the time we arrive. That way I can contribute a vegan dinner for everyone, without having to cook in someone else’s kitchen! That’s amazingly fast. I will definitely try some of these for my pre-made breakfasts and lunches during the school week! They’ll be perfect. Everything looks MEGA Tasty ! This is fantastic! I’m going away for an evening this weekend and for a long vaca in 2 weeks and this will be very helpful (I’m traveling with meat eaters). Thank you so much for sharing! Hey Angela, Is there any particular reason to use bins made of glass? This is going to be so helpful. I’m roadtripping it this week so that will be great! Def going to bring along some overnight oats. We take a lot of road trips!!! We being my husband, 4-month old baby, 2 dogs, and I. Several times a year we make a 12-hour drive to visit our family in the Midwest. We pack meals for the drive and snacks to have on hand when we get to our destination. Chickpea salad is a go-to for us. I like to cut up all of the vegetables that will spoil while we’re gone and then we dip them in our chickpea salad. Also, energy bites are perfect and I typically make a trail mix with raw nuts and seeds and dried fruit. Also, I like making hearty banana pancakes. We spread some peanut butter on top and they are delicious and easy to eat on the road. I like packing a container of berries as well. I’ve found that if we travel with a fruit that has the potential to bruise, then undoubtedly it will!! Unintentional mashed bananas aren’t the best. I always fill up 6-8 water bottles for the trip. I store them in a 6-pack wine “green bag” that I got at Whole Foods. There is nothing worse than buying a $2 plastic bottle of water at the gas station. If you make the overnight oats, how long would they be good for? i.e 1 day, 2 days kind of thing? Ok, so this couldn’t have come at a better time. I too went away last weekend and made the Chickpea chicken salad. Holy Moly it was delicious! AND it totally tasted like chicken salad – without the meat taste. THANK YOU. All the meat eaters loved it too. I’m overly enthusiastic about your recipes and blog because they are just the best and it’s so exciting to have glorious vegan gluten free food. Thank you! OMG, I love this. Going to try something like this next week. My hubby and I did a 9 day road trip and packed most of our own food. I think we ate out at restaurants 4 times, and thats because we wanted to. Our car was PACKED with food and cooking supplies, to say the least. But it was so worth it and completely doable, with some planning ahead. we cooked our travel day meals in advance so we had food to eat when we needed a rest stop/break. Packing fruits, granola bars and other non perishable food items for day to day shenanigans was so helpful and convenient to stay on track. This is so awesome! What crackers are those? How long will the Dark Chocolate Cherry Energy Bites stay fresh? Can I make a batch that will last a couple of weeks? thanks for these helpful tips, i was planning for holidays next month. And the food is well presented , nice job. i just read your recipe of vegan oats . goona try that one first, seems delicious. Keep sharing these kind of post with us . thanks for these helpful tips, i was planning for holidays next month. 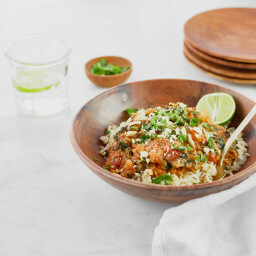 goona try vegan oats recipe first , seems delicious. keep sharing these kind of post with us. Nice Job. Hi Scott, I’m glad you found this post helpful. Enjoy the vegan oats (and anything else you might try! ), and have a great holiday! Knowing what food to bring when traveling as a vegan has definitely been difficult for me so far but hopefully it’ll get easier over time! I went on 2 ski trips last month and both times I brought your delicious caesar dressing (HUGE hit), mac & cheese, curry lentils, black bean soup, etc. This post gave me some good ideas for my next trip! Love the ideas! Any suggestions of what foods to pack when flying? Thank you, Angela, for this post. This will work well especially for kids too because I find too many restaurants still use too much salt (despite at times asking for reduced salt). As for myself, I will still need to have my coffee and I use organic whole bean. Luckily, there are small coffee travel kits that would work great with this away meal plan! We live in Europe and travel often. I pack some of the things you do along with your chickpea flour pancakes. Those are great to travel with, especially on the plane or train. I pack my lunch or travel food without cooling devices. If it’s vegan, I’m never worried about issues with food being room temp and much prefer the taste of eating room temp food vs food from the fridge or ice chest. Hummus is great at room temp as well. We just came back from a Germany to England drive with my 4 year old and lots of great vegan food, and are going to Berlin next week. Will be sure to make your bars to take along. Would love to take protein/healthy muffins too – do you have a recipe? Gotta say I’m impressed by this article! It has a lot of valuable information, and I’ll make sure to try those wraps. It seems like you focused on medium-budget food. It would be great if you could spin out a cheaper version of this. I’ve tried the energy bites before, and I’m definitely gonna keep on making them!